I took the Kodak Medalist on our trip down to San Juan Bautista and shot one roll around the mission. This was the first picture that stood out when I looked at the negatives and I'm very happy with it. 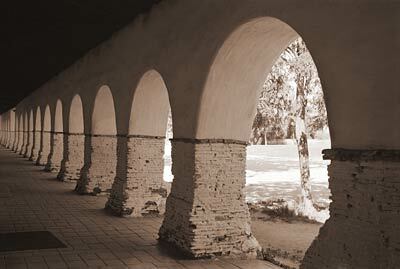 We were at the mission building a little bit late in the afternoon when the other tourists had already left and the mission was closed for visitors, so it was easy to set up this shot without having to worry about other people walking into the frame. Since I only have eight shots on a roll with the Medalist, I'm always very slow in setting up to make sure I've crossed all the t's and dotted all the i's before I hit the shutter. Shot taken with my Kodak Medalist on Ilford Delta 100. Click for a larger view.